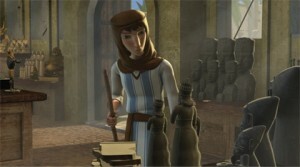 Young Abraham (“Avram”) contemplates smashing the idols in his father Terach’s idol store. Here is something that both adults and children will greatly enjoy: a high-quality animation of the early life of Abraham the Patriarch, as he searches for, finds, promotes and sanctifies the One True G-d, the Creator of Heaven and Earth. The movie plot is based on the Midrash.